Pesto Spaghetti Squash Casserole is a Monday Night Italian favorite meal. 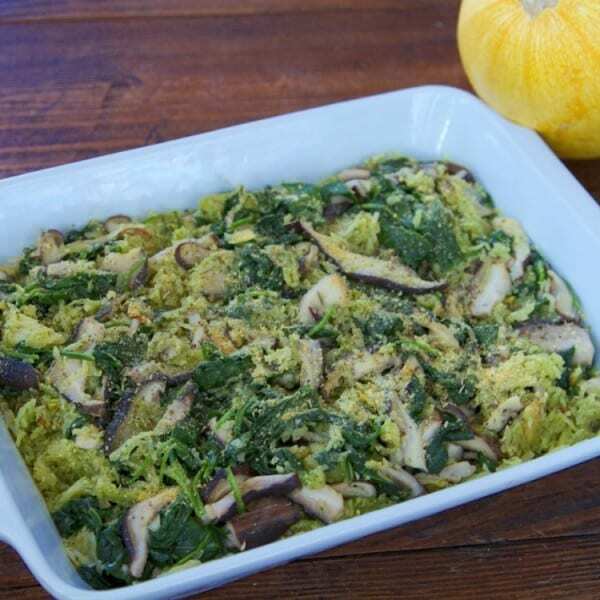 Pesto Spaghetti Squash Casserole is a Curry house Monday Night Italian dinner favorite. It’s a dish that satisfies literally every food intolerance or allergen! Once all the girls (Megs has 3 sisters), all started becoming more aware of their simple carbohydrate intake I would find alternatives that met everyones liking and preference. Pesto Spaghetti Squash Casserole quickly became a family favorite. The great part is you can make it a day ahead or in the morning for dinner. It helped a lot when the girls were all young. I personally love spaghetti squash for it’s versatile ways you can use it! We love to use it to make a Mexican bake using the spaghetti squash and even a spaghetti squash pancake/fritter that is a wonderful change from our traditional potato pancakes we eat for the holidays. 1 spaghetti squash cut in half lengthwise. Remove the seeds. Once cooled use the fork or spoon to scrape out the squash shreds into a bowl. Add olive oil and pesto to squash shreds, and set aside. 2 Zucchini sliced, diced or cut into rounds (These may be grilled, sautéed or roasted) Broccoli florets work well too. Lightly baste zucchini’s in olive oil and sprinkle with sea salt. Place zucchini’s on pre-heated grill or in a 350 degree preheated oven. If roasting, place on parchment lined roasting pan. Roast or grill until just softened. Grilling takes about 5 minutes per side, roasting about 20 minutes. Saute sliced shiitake mushrooms in 2 Tbsp. olive oil with 2-4 minced garlic cloves. Cook until softened and nicely browned. Covering helps speed up the cooking. Cook until mushrooms are soft. Next add box of pre-washed spinach into the mushrooms. Sprinkle with ½ tsp. of sea salt cover and cook JUST UNTIL WILTED. Remove and set aside UNCOVERED. This method helps the spinach NOT get watery. If using a large box of spinach, you will need to do this in 2 batches, or continue adding uncooked spinach to wilted spinach, stirring as the leaves become just wilted. This should take 2 minutes. Set aside in a colander to drain IF NEEDED. Sprinkle with Nutritional Yeast and Italian seasonings, Fresh ground Pepper. Top with goat or sheep feta. Then sprinkle with Pecorino Romano Cheeses. Bake in preheated 350 oven for 20-30 minutes until hot and bubbly. Serve with a lovely salad. VERY satisfying!